Have you ever felt something is just not right with the design of one of the rooms in your home? Before rearranging your furniture for the fourth time, consider all possible lighting options. Regardless of the size of your space, lighting can have a huge impact. However, lighting is also one of the most underused tools in design. Considering it affects the way humans view everything in their line of vision, one would think it would be more widely employed. Major renovations aren’t always necessary to highlight the best parts of your living quarter. With the proper lighting, you can trick the mind into perceiving the desired effect in a room without tearing out walls or changing all your furniture. A well planned lighting scheme can give you all the results with a fraction of the effort or cost. As most of us know, brighter rooms appear bigger and often more welcoming. If you wish to give a small room more grandeur, lighting and neutral-colored paint are your best friends. Light to mid-toned shades of paint will make walls appear wider and work well with both artificial light and sunlight. When using lighting to enhance a space, think vertically. The ceiling and floor act as the fifth and sixth walls in the room; sending light to these extra “walls” will add height to your ceilings. The key when dealing with smaller spaces is to eliminate unnecessary clutter. To get the most out of your space and to help it look its best, you want everything to have a purpose – this extends to your lighting as well. 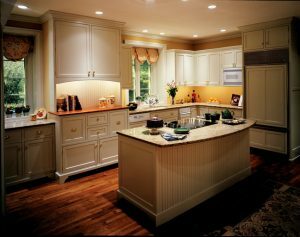 Options that offer maximum functionality while also enhancing the design of your home are best. Recessed lighting is a great addition to a room that already has a main ceiling fixture and decorative accents. Today’s recessed LED bulb fixtures provide an even wash of light, allowing you to avoid the spotlight effect of traditional bulbs. Placing these lights on a dimmer is key, as you will need to adjust them as the natural light in your home cycles throughout the day. There are many ways you can use lighting to enhance your space, and working with a trained lighting professional is the best way to ensure you’re getting the most bang for your buck. Shop online or find a lighting showroom near you.